" The Sound of Marantz is the compelling warmth of a Stradivarius. It is a dancing flute, a haughty bassoon and the plaintive call of a lone French horn. The Sound of Marantz is the sound of beauty, and Marantz equipment is designed to bring you the subtle joy of its delight. Wonderful adventures in sound await you when you discover that the Sound of Marantz is the sound of music at its very best." Service Manuals A. G. Tannenbaum Just really great people. I've ordered a number of manuals from them, they're 100% trustworthy and the quality of the copies is very high. Hit their manual indexes under "M" for Marantz data. HA-1156 Stereo Decoder IC's, Marantz number HC1000401 Fistells They can get replacements - I saved a 2240's FM stereo capability with this part! Dial Fuse Lights Parts Express The factory specifies an 8 Volt 200 mA lamp, but you can buy the 8 volt 250 mA "fuse type" lamps, part no 070-120. The cost is $.50 for 10-up quantity. You can also find these on EBay; search for marantz lamps. Make sure you know what current you're getting - 200 ma or 250 ma. Note that the extra current requirements can add up, as can the extra heat, which amounts to a twenty five percent increase; think twice before replacing an entire set with higher current bulbs. I don't know how much extra current is available for the lights on a per-unit basis, though I know of no case where this has caused a problem with the power supply. I have seen melted plastic bezels from using full sets of 250 ma bulbs. WARNING! The FM stereo light requires a lower current lamp than the other indicators in circuits using the HC1000401 PLL IC. Using the same bi-pin lamp overloads, and can blow out, the stereo decoder IC. That is why I had to replace the HA-1156 mentioned above! I do not have a source or details on the current requirements for the bi-pin stereo indicator lamps. If it is the stereo indicator you need, be sure to tell the Marantz representative that! 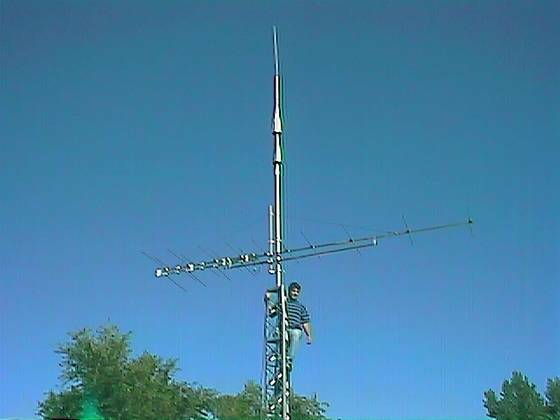 The antenna is an APS-14 (they now sell an APS-13) It is a large, 14-element, dual-driven director-only design that pulls in KMHK, a classic rock station 179 air miles (see map here) away in Hardin, Montana fairly reliably, as you can see at the right top. That's a full quieting signal about 99% of the time. Afternoons, skip does tend to come in and whack KMHK upside the head, but that's actually kind of fun. I live on the plains, so terrain conditions for this kind of distant station reception are just about ideal, but the point is that at 179 miles, you need a pretty amazing antenna to pull a microvolt or two into your FM front end! The tall pointy antenna above the APS-14 is an AEA "Isopole", a 144-MHz design that is omnidirectional and listens at the horizon level. I use it to catch DX conditions on FM, though it's detuned at 88-108 MHz, it still does a very credible job on the FM broadcast band. Those Pesky Speaker Protection Circuits N/a The relays in Marantz receivers (and likely the amplifiers) of the 2245 vintage and later often had a problem with corrosion on the silver contacts used in their manufacture. The most horrendous of these was the intermittent loss of signal from the amps to the speakers due to corrosion on the contacts of the protection relay. The receivers had a protection relay between the amp outputs and the speaker terminals. When the power switch was pushed there was initially no output to the speakers. After the power amp was on for about 2 seconds the relay switched on and the speakers were heard. When the corrosion was present the signal would intermittently cease for very short periods. The loss of signal was so short that it was infuriating. Cleaning or replacing the relay fixed the problem in most instances. "Wet or Dry" paper--available in 2400 grit, 1200 grit, 600 grit. The finer grit is better, don't use anything courser than the 600 grit. 600 is readily available at any hardware store, Lowes', home shop, etc. 1200 and 2400 are more likely to be obtained at NAPA or an automotive paint store (Dupont, Sherwin Williams, or whatever). Most of the time, the available size is going to be about 8"x11", but sometimes it comes smaller. Cost is about 50 cents/sheet give or take, with the finer grits being slightly higher. Take a narrow strip (1/4" approx, cut or torn), fold it in half and crease it with grit sides facing out, and then separate the contacts, slip it between, and withdraw letting the contact provide its' own pressure. Repeat if needed, then clean any dust and grit out with a strip of paper towel, or or other lint free material. This is important, since the slightest non-conductive dust on the newly cleaned and polished surfaces can easily prevent electrical contact, especially at the low voltage/current values we are usually dealing with. The fineness and thin aspect of this improvised "paper cleaning file" keeps the points in proper relationship while being used, so distortion or flattening of the contact point is minimal, if any. General Electronic Restoration Tips N/a Our Marantz gear has, in general, withstood the test of time quite well. However, time has, and is, modifying these units every day, and they move further away from the original design specifications as a result. What can we do? Should we do anything? I think we should. And we can. My aim here is to provide some general tips that are aimed at electronics types. If you're not technically sophisticated, just skip this tip - you don't want to electrocute yourself, or ruin your prized Marantz. Carbon Resistors: These components age rather quickly compared to most other components. As they age, two things happen. First, they change in value. That doesn't have to be a critical problem; A good design will put a value in there that based on the rated tolerance of the resistor itself lands dead-center in the middle of the needed value, and so there is some room for change. I think we can be confident that Marantz got this right very consistently based on the observed performance of the units. Still, you should be aware of it. The second thing is that they actually get noisy. That's right - they generate noise! For this reason alone, it's a good idea to replace them if they are found in low level signal circuits, either audio or RF. Choose the replacement carefully. For audio circuits, high precision metal film resistors are great. For RF, they're terrible. This is because of the RF signal characteristic known as "skin effect". RF tends to flow on the surface of a conductor, rather than inside it. So the film resistors turn into odd-value components that also, unintentionally, contribute inductive and capacitive components to the circuit. Find a resistor type that meets the design limits - value, tolerance - that is designed for RF-neutral operation. Consult your parts manufacturer. I cannot overemphasize this issue - never use a metal film resistor in an RF signal path of any type. Electrolytic Filter Capacitors: These, along with carbon resistors, are the components that change the most and have the most deleterious effect(s) on the sound and performance of older audio gear. Factors that affect these parts include age, frequency of use, heat, and signal characteristics. Things that change include the actual capacitance, the internal resistance, the apparent inductance of the part, the breakdown voltage and the leakage. In short, basically everything changes, and rarely for the better. The electrolytic's dielectric can dry out, and that leads to all manner of bad things. Eventually, they will either fade away in capacitance, open, or short out, this last behavior often causing circuit damage. So these are prime candidates for a replacement program. When you replace an electrolytic, use the same value in microfarads. Resist the temptation to increase the value of filter capacitors, for instance. Why? The general answer is that the designer(s) knew what they were doing - they didn't just "put" those values there, they designed them in for one or more reasons, and in the case of Marantz designs, cost was usually not the key factor. A more specific answer is as follows: If, for instance, you put in larger capacitance value power supply filter capacitors, the cold-start inrush current into the caps, and thru the rectifiers can be significantly greater than the rectifiers - and perhaps the power transformer also - were ever designed to handle. If a rectifier blows, you can cook off a lot of the rest of the unit... and you don't want that, right? In signal circuitry, the electrolytics perform more than signal transmission functions, they also are part of the inter-circuit impedances, and those can affect frequency response and phase shift, both of which can produce immediate (and annoying!) changes in the unit's ability to handle audio. Back to replacement specs; specify the same, or higher, voltage rating on the electrolytic. Use polarized parts where polarized parts were used (probably everywhere... otherwise use nonpolarized high quality caps, of course). Don't replace nonpolarized with polarized, ever and don't replace polarized with nonpolarized even if it seems like nothing could ever happen as a result - it can, trust me on this. Nonpolarized electrolytic caps tend to die if they are kept polarized one way for long periods of time. I don't know why, but I do know this to be a fact from long personal experience in repair and design. Potentiometers, Switches and Buttons: These get noisy because they are simply accumulating dirt and/or corrosion. When they are on one position, the surface of the contact for the open circuit or part of the path of the pot's wiper is uncovered, and it picks up debris and/or corrodes. The best cure, hands down, is a good "tuner cleaner" product. I know people who spray 3&1 oil on pots and switches. It works, but it can be messy initially, and because the lubricant leaves a tacky film, it forms the basis for future debris accumulation problems. Of course, oil being what it is, spraying again with 3&1 again fixes the problem completely for a while, and if that makes you happy... hey, do it. :-) But a nice tuner cleaner with a built in dry lubricant (like that blue stuff I can't remember the name of right now) works as well, and for longer. After applying, run pots through their full range at least ten times, perhaps more. Work switches in and out. Do all of this with the power off - it won't help to have it on, and in some cases might hurt. Speaking of power, the power switches and speaker switches are problem areas. They corrode like everything else, but because they handle so much power - high voltage and some significant current in some cases as well - they're a bit tricky to clean up. Sometimes it takes a few tries, and sometimes you simply have to maintain them at a higher rate than anything else in the unit. Ed Furguson Sent this along: "I bought a cleaner from Parts Express that was advertised as an electrical contact cleaner for potentiometers and other contacts. I sprayed it into my Marantz 2270 volume control and a chemical reaction shattered the plastic stops inside the control. I'm now looking for a junk receiver to repair my previously near-mint 2270. The fine print on the can says test on plastics before using - Duh - how would you know? Please warn your readers about cleaning their controls." So consider yourselves warned. Myself, I have come to prefer a fine grade machine oil, rather than a chemical cleaner. If it gets dirty, you just spray it again, and it is very unlikely to hurt anything in your precious audio gear. Plugs, Sockets and Relays: Just like switches, plugs and sockets accumulate corrosion and debris. Pull them, douse both the male and female ends carefully with the tuner cleaner (or 3&1) and then plug them into, and pull them off of, each other at least ten times. This "wipes" the surfaces against each other, helping to remove corrosion. The oil is a good deal in this case, because since the connectors don't have to move, unlike a switch, the oil will just sit there. It seals the surface, reduces future corrosion, and generally helps and does not hinder. This is also true of external plugs, such as RCA jacks. Don't use oil or tuner cleaner on relays. Relays need to be "dry" - the only good relay is a dry relay. File your relays using the finest file you can locate, and we are talking very fine here. This is true of any relay, but in the case of our classic amps and receivers, these speaker protection relay connections carry a lot of current and anything other than contact to contact connections will age the contact faster than it would otherwise normally age, leading to more problems. Replacing the small bulbs (stereo, Dolby, dial pointer, etc) n/a Often, it is difficult to obtain correct replacements for the smaller incandescent bulbs used in older Marantz units. This tip describes an way around the problem for bulbs that match physically but not electrically. Something you can do to replace the smaller bulbs is series a couple of bulbs that aren't the right amperage, but the right physical configuration. For instance, if you have trouble getting the right bulb for the dial pointer because of current (ma) requirements, you can often take two higher current bulbs that are physically correct, and series them, mounting one in the designed location, and the other somewhere handy inside the chassis where it won't show. The trick is to make sure that the resulting current requirement is less than that of the factory-specified bulb. As an initial rule of thumb, if you series two bulbs, the bulbs will probably draw less than 1/2 of the rated operating current; if you series three, less than 1/3rd, and so on. This is generally true when the sum of the lamp voltage ratings is higher than that of the applied voltage across the whole series string. Even when that is true, because the resistance of a hot filament is nonlinear and varies with the design of the filament, you must measure the current drawn by the series string and actually verify that it is under the rating for the Marantz unit. In at least one case - stereo indicators - setting up a situation where the current draw is more than the rated amount will cause damage to the receiver (destruction of the stereo decoder IC in this specific case.) So measure! For example, recently I replaced a stereo indicator that was supposed to be 30 ma/12v with a series of two 8v/40ma bulbs. The sum of the rated voltages is 16v, so my rule of thumb that says the current draw would be 1/2 or less than the rating (40 ma) comes into play. I put one on the indicator, and the other I mounted behind the indicator panel, inside the chassis. When I measured them, the current draw at 12v was only 16 ma, the bulb was more than bright enough, *and* the voltage across each bulb was only 6v, so they'll likely last much longer than they would if used in "normal" 8v service. As a side benefit, the load on the stereo IC's lamp driver circuit was decreased from 30 ma to 18 ma, and that IC is now likely to last longer as well. Rock EQ with Separates n/a Rock music fan? Me too. You know what the "Loudness" contour does? It kicks up the amplitude of the low bass and higher treble signal components when the level of the music is low. The idea is to increase the levels just enough to match the amount that your ears lose sensitivity to those tones as the overall level of the music drops. So, as you turn the music down, the parts you would normally begin to lose track of remain perceptible to you. Which is fine. Preamps are designed to apply more and more loudness contour as you turn the volume down, or less and less as you turn it up, however you want to think of it. Turn the amp gain controls all the way up and leave them there. If you have control of the source volume - E.G., tape deck settings - then turn that up as far as possible without distortion. Finally, control the volume exclusively from the preamp. Here's why: The loudness setting on the preamp has less and less effect as you turn the preamp's gain up. So, with the amp turned up, and possibly the source signal turned up as well, you don't need to advance the preamp gain that far to get a high output. And, with the preamp gain setting lower, the loudness contour is further engaged, hence stronger bass (and treble) enhancement. Of course, you can push this even further with the bass equalization controls on the preamp.